We have one of the largest ranges of sudoku variants available anywhere in the world available for publication. If you are looking for something a little different to the standard 9x9 sudoku, and perhaps want a puzzle that will stand out, then you can be sure that Clarity Media will have a sudoku variant puzzle that fits the bill. To see some of the most popular sudoku variants we have, take a look at this pictorial list of our puzzles, which include rare variants such as Isosudoku puzzles. 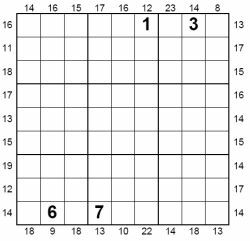 Some of the sudoku variants are quite commonly seen: such as sudoku X, and to some extent the multi-grid puzzles such as samurai sudoku. Others however are seen much less often, from the intriguing consecutive sudoku that indicates adjacent cells that are consecutive in value (for instance 1,2) to even less commonly seen variants such as Sudoku Plus. An example of this puzzle can be seen to the right: here there is a mixture of sudoku and kakuro logic whereby numbers around the outside of the puzzle indicate the sum total of the first/last three cells in each row/column. Whatever type of sudoku puzzle you are looking for, then we are sure to be able to help, and can even create custom region puzzles to fit with your particular brand or piece of marketing. Simply let us know what you're looking for and we'll do our best to help. Publishers - Please contact us to buy Sudoku Variants puzzles for publication in your book, magazine, newspaper, any other printed media or online.